Dutch yard Van Der Valk has released the first images of its new 25 metre explorer yacht, which was recently launched and named Dutch Falcon. Built on speculation to CE Category A standards and currently offered for sale, this all-aluminium cruiser features styling inside and out by Dutch designer Guido De Groot. 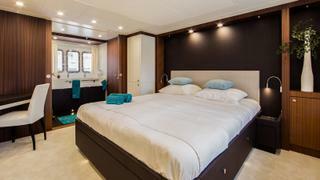 Accommodation is for eight guests in four cabins, split between a full-beam owner’s cabin, a VIP, a twin room and a bunk bed cabin, while the crew quarters allows for a staff of up to four people. 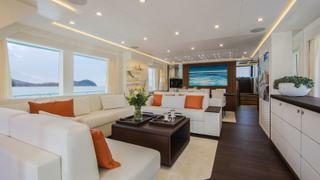 The main saloon features a C-shaped wrap of seating just aft of the formal dining area. An amidships day head sits alongside the galley, just aft of the wheelhouse. 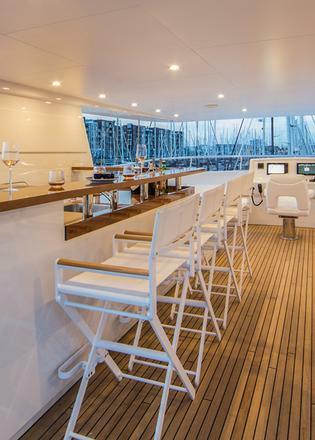 The 60 square metre upper deck provides a second helm station, further seating, a full bar, and tender storage space aft. As these first interior pictures reveal, Dutch Falcon has been tastefully finished with a combination of dark timber flooring, pale cabinetry and colourful accents. 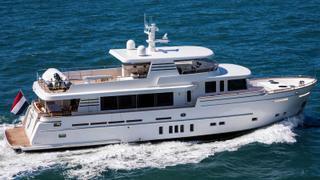 The round-bilge, fast displacement hull was development in collaboration with Ginton Naval Architects to offer fuel-efficient, long-distance cruising. Her vital statistics include a beam of 6.8 metres and a maximum draught of 1.8 metres. Power comes from a pair of 390hp Caterpillar C12 ACERT engines for a top speed of 12.8 knots, while her total fuel capacity of 12,760 litres means a maximum range of more than 3,000 nautical miles is possible when cruising at nine knots. Dutch Falcon is available for immediate delivery and the yard adds that there is still scope for an owner to put their stamp on her, with options for adjusting the styling, accessories and some of the machinery and equipment. Other projects currently under development at the Dutch yard include the 26 metre Forum, another collaboration with Guido De Groot, which was recently launched and is due to be delivered before the end of the year.